When it comes to my computer setup, I prefer having at least two displays on my desk. It’s a lot easier to work when you have all that screen real estate. In my setup, I have a laptop and an external display; but when I have to unplug my laptop and work remotely, the single display feels cramped, even on a 17-inch MacBook Pro. It helps to use Mission Control and create multiple desktops, but it feels so inefficient to shuffle between desktops all the time. Last December, GeChic released the On-Lap 1302, a 13.3-inch portable external display for laptops. Weighing only 23 ounces, the On-Lap 1302 is light enough and small enough to stash in your bag with your laptop. Though the On-Lap 1302 display itself is rather ho-hum, you can have a two display setup wherever you go, even if you’re working out of your local library or coffee shop. Looks Like a PC: The back of the On-Lap 1302 is plastic and could be mistaken for the top of a PC laptop. 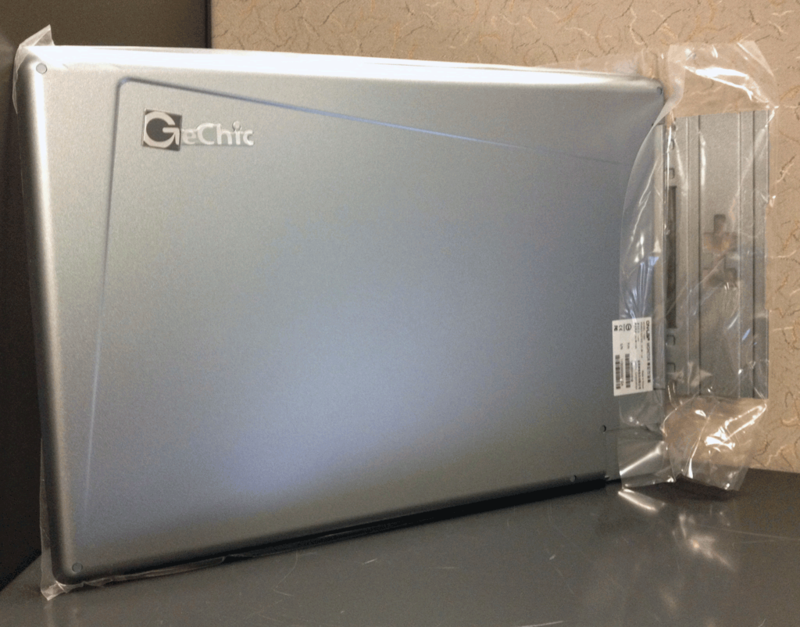 We’ve had the GeChic 1302 for a while, but since it requires an HDMI connection, reviewing it wasn’t a priority—MacBooks in the past few years have used either a Mini DisplayPort connector or a mini DVI connector. You need to buy and use an HDMI adapter. But Apple released the Retina MacBook Pro ( ). In addition to the two Thunderbolt ports that can be used with Thunderbolt or Mini DisplayPort displays, the Retina MacBook Pro is the first Apple laptop to sport an HDMI port. No adapter is needed to use the On-Lap 1302. 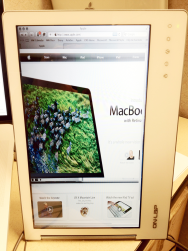 A major issue with the 15-inch Retina MacBook Pro is the screen real estate. 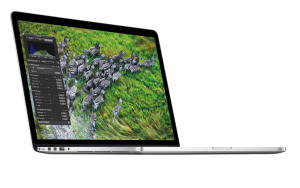 Apple discontinued the 17-inch MacBook Pro, with the idea that the Retina MacBook Pro acts as its replacement. While you can set the Retina MacBook Pro to a resolution that, according to OS X’s Displays preferences, “Looks like 1920 by 1200,” everything on the screen is smaller—for some, that’s an unacceptable alternative to the 17-inch MacBook Pro’s native 1920 by 1200 resolution. 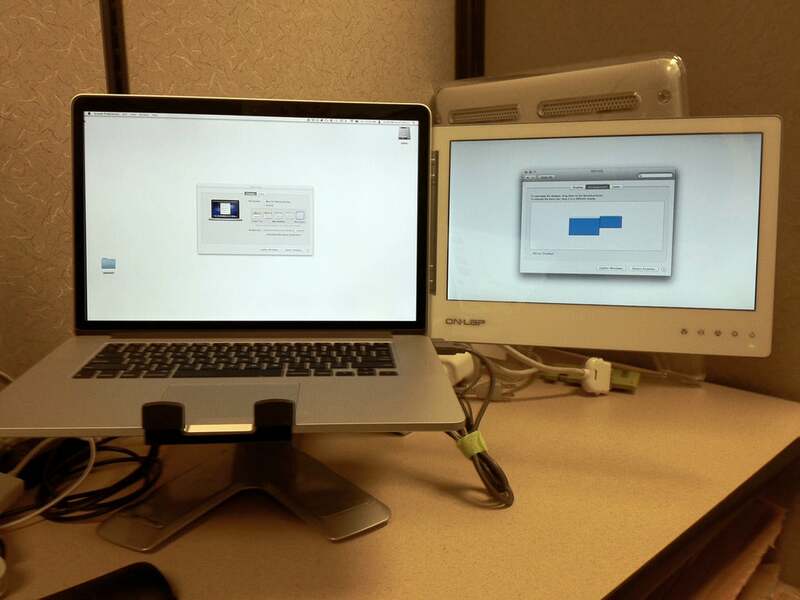 Dual Display: The On-Lap 1302 mounted to the MacBook Pro. If you prefer not to use the Retina MacBook Pro’s More Space (Looks like 1920 by 1200) setting, using the On-Lap 1302 with a Retina MacBook Pro can help add additional screen real estate, but it’s still a compromise. The On-Lap 1302’s image quality isn’t up to par with the MacBook Pro’s built-in display, even when the built-in display is not using the Retina setting, and you’ll have to do some window management to figure out how to best use the On-Lap 1302. But it’ll definitely help relieve that cramped feeling. Portrait Mode: You can use the On-Lap 1302 as a portrait display. You must set the screen to rotate 90 degrees in the Displays system preference. However, the screen might be too narrow for some websites. 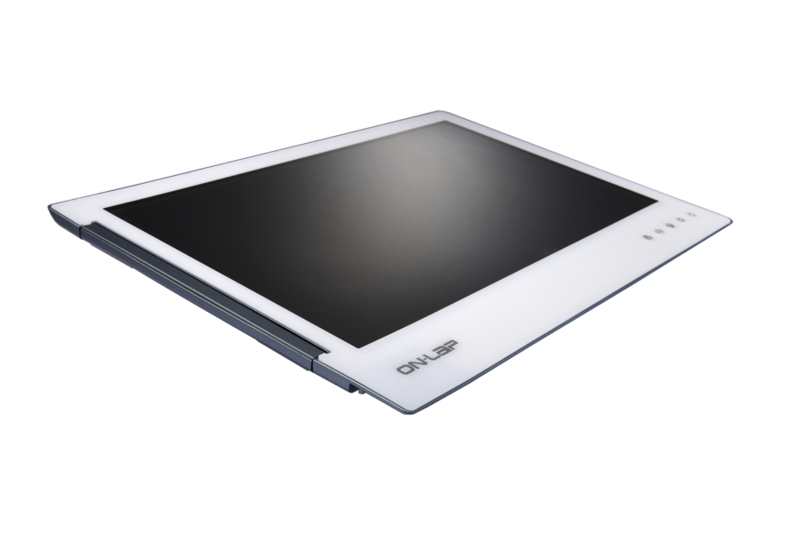 The On-Lap 1302 has a 13.3-inch (diagonal) display with dimensions of 13.15 by 8.94 by 0.31 inches. The display comes with a combo cable that has a connector for the display on one end and separate USB and HDMI connectors on the other end, which you plug into your Mac. The USB connector provides power to the On-Lap 1302. To get your display up and running, all you have to do is make all the cable connections and turn on the On-Lap 1302. On my Retina MacBook Pro, the On-Lap 1302 was instantly recognized, though I had to do some rearranging in the Displays system preferences. The screen itself, with a native resolution of 1366 by 768, is an acceptable secondary screen. I like to use a large display where I do most of my work, and a second, smaller display as my “communications console,” where I have Mail, iChat, Twitter, and a Campfire chat room open at all times. The On-Lap 1302 works well as my console when I’m using the Retina MacBook Pro’s display as the main screen. The On-Lap 1302’s image quality, however, pales in comparison to the Retina MacBook Pro’s display—or any MacBook display, for that matter. The color quality is fine, but flat. There’s some minor banding on color gradients, and the detail is acceptable for general use, but it’s not as sharp and crisp as the regular MacBook Pro display. If you’re performing color-critical work or image editing, you may not want to rely on the On-Lap 1302. Stand and Mount: The included Stand Bricks (top right) can be used as a stand. 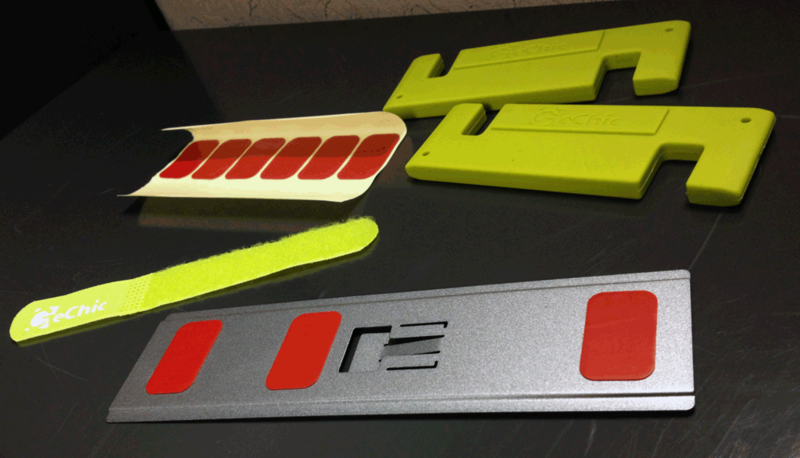 The Holder Plate (bottom) is used to attach the On-Lap 1302 to your laptop. GeChic also provides a cable wrap and extra mounting tape. The biggest problem with the On-Lap 1302 is the viewing angle. It’s fine when the On-Lap 1302 is directly in front of you; it’s still fine if it’s off to the side next to your primary display—but you’ll be sitting at the outer range of the On-Lap 1302’s viewing angle. If you move to a sharper angle, the degradation in image quality is very noticeable. Compared to the Retina MacBook Pro, which has the advantage of having an IPS display, the viewing angle of the On-Lap 1302 is quite narrow. Another problem is that the On-Lap 1302’s front is susceptible to glare, even more so than the regular, non-Retina MacBook Pro. When you combine the glare with the small viewing angle, you end up being more conscious of where you sit in regards to light sources. A Better Stand: The optional Stand Bricks 2 is a better stand. GeChic includes a set of ugly, green Stand Bricks that act as a stand for the On-Lap 1302. The Stand Bricks have notches that fit on the side of the display, but they make for a horrible stand. The display ends up at an awkward angle; it faces too much towards the ceiling, and often, the display would collapse. 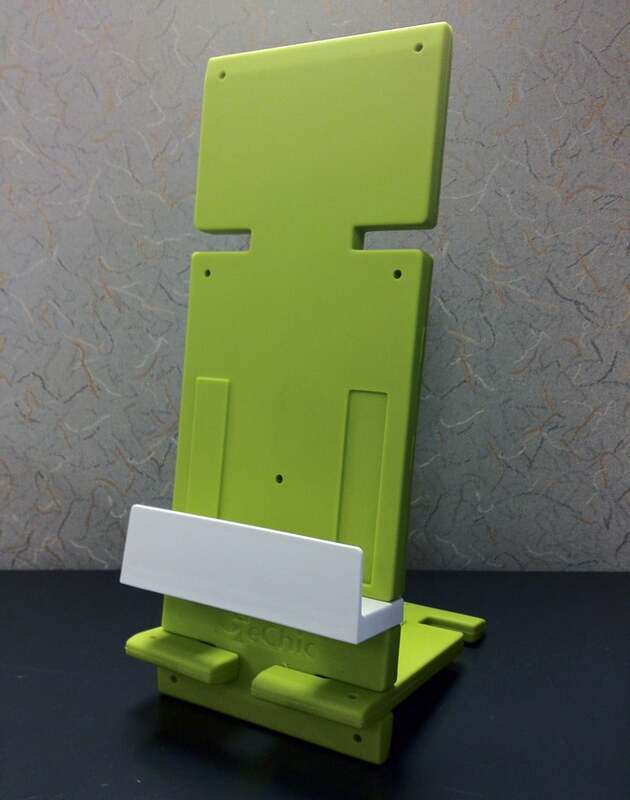 GeChic offers the Stand Bricks 2 (still green, still ugly) as an optional accessory, which has more pieces and can be put together to create a much more effective stand. 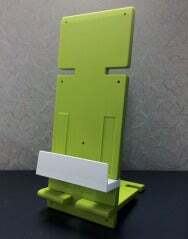 You can also use the Stand Bricks 2 as a stand for your iPhone or iPad when it’s not holding the display. Stand Bricks 2: Made of sturdy plastic. The On-Lap 1302’s laptop mount is an interesting accessory that creates a two-headed laptop. You mount the On-Lap 1302 on your laptop’s display, using a hinge on the left side of the On-Lap 1302. The hinge latches on to a Holder Plate that you stick—yes, I said stick—on the back of the laptop’s display with double-sided tape that GeChic provides. The assembly isn’t difficult, once you get over the idea of sticking a piece of metal to the back of a laptop. Over a month’s time, the tape didn’t seem to weaken, but I do wonder when the tape will eventually give way. 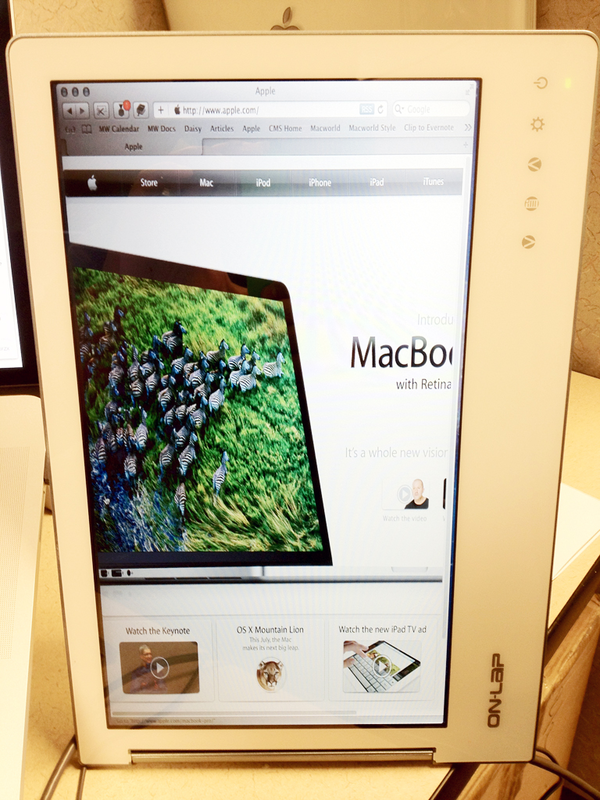 The On-Lap 1302 looks like a PC display, and it doesn’t match the design of the MacBook Pro. It has a white bezel, and the back of the On-Lap 1302 is gray and looks like the lid of a PC laptop. The design aesthetics don’t bother me when I’m using the laptop with the display, but when you fold and close everything up, the On-Lap 1302 is still exposed, leaving it susceptible to scratches. You can slide the display off the Holder Plate, which is what you should do when you’re not using the On-Lap 1302, but then you have a Holder Plate stuck on your laptop, and the Plate often got snagged in my backpack. Connected: A closer look of the display mounted on the MacBook Pro. Overall, I preferred using the Stand Bricks 2 to the included Stand Bricks and the Holder Plate mount. It’s another item to carry around, but it offers more flexibility and it feels more secure. The Quick Installation Guide also warns of the laptop toppling if the On-Lap 1302 is mounted, and even though I never had that happen, it’s another reason to go with the stand. A second screen with your laptop is great for doing production work. The On-Lap 1302 can be helpful for when you need more desktop space at a remote location, though you don’t want to rely on it when color accuracy and extreme detail are part of your tasks. There are issues with the viewing angle and glare, which means you’ll need to be picky about where you set yourself up. But overall, the On-Lap 1302 is a useful, portable device.